What is A Dry Basement? A basement is the underground area of a house or building. It’s surrounded by loose soil so it feels warm and oftentimes it gets wet when it’s raining hard or after a fast thaw. Some, especially older basements, are hard to keep dry 24/7 but with regular proper care and attention it’s possible. A dry basement is the absence of leaks and cracks. It’s properly ventilated too. Keeping a basement dry is a team effort. You can’t do it all by yourself. If you’re the homeowner, your responsibility is limited to cleaning the walls and floors but if you notice inevitable problems such as musty smells and uneven surfaces, you’d better call a basement waterproofing company like Vulcan Waterproofing Inc. for a free inspection. A commercial basement needs teamwork too. Regular inspections are a must. A dirty or wet basement produces musty smell. Excessive mold growth, mildew and dirt make it even worse when ignored. The natural airflow will carry the stench upward circulating around the house (Wave Home Solutions, January 2016) while you inhale its toxins. That’s why; investing on a ventilation system is a priority. It makes the air fresh, healthy and safe. A dry basement means you and your family are safe from respiratory problems such as nasal stuffiness, coughing, throat irritation, allergic rhinitis and asthma attacks. A dry area but with extreme humidity is bad for your health. It irritates your skin and causes headaches too. That’s why proper ventilation is strongly recommended. Your basement’s framework is guaranteed to last long if the humidity level is constantly monitored. The underground pressure won’t produce moisture that causes the structure to rot. A healthy and clean basement allows you to save money on heating and cooling expenses. A home improvement research reveals it takes less energy to heat and cool dry environments than wet areas (Wave Home Solutions, January 2016). A house is a major investment. Chances are you can easily sell it when the right opportunity comes. More potential buyers will want your house if it has a waterproofed basement. It gives them a feeling of security and confidence that they’ll get what they’ll pay for. Buyers always prefer a clean house with durable roofing, beautiful flooring and a functional basement. Give them these and a fast sale will come to you naturally. Let your imagination run wild. 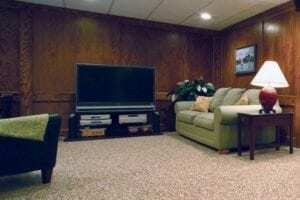 You can transform a basement into an entertainment room, game room, mini-library, home gym or even a space for rent. It’s easier to keep your basement dry if you’ll perform a list of activities every time a new season unfolds. Remember: You can’t do the following activities all by yourself so it’s best to hire someone or a professional to assist you. Before winter, call Vulcan for a free basement inspection. Clear your gutters from leaves, bird poop and debris. Check your downspouts. Replace the ones with holes. Shovel thick piles of snow away from your garage and foundation. Frozen water pipes must be replaced immediately. Make sure your sump pump functions well. First thing in the morning, look around for inevitable cracks. After winter comes spring. It’s the season of melting ice and cooler nights. Temperature plays at 30 to 70 Degrees Fahrenheit. Wearing coats and gloves outside is a must. As for your basement, it easily becomes wet. So, take proper precautions. Check your gutters. The pressure might have damaged them. Keep melting snow away from your foundation. Double-check if downspouts drain the water properly. Extend the downspouts if necessary. Take time to landscape your front and back yards. Check your plumbing system. Look around for leaky pipes. April Heatwave is possible so a basement dehumidifier helps. As they say, summer is the opposite of frost. The state of New York gets hot. Humidity is high and there are thunderstorms too. Although the temperature ranges from 64 to 85 Degrees Fahrenheit, the summer season marks the start of a hurricane season that lasts from June to November (NYC Emergency Management, 2016). As expected, your basement heats up. It’s also the time when you might start forgetting your side of the deal and not do the work. But don’t! Think summer as the best time for basement waterproofing. Invite Vulcan for a free estimate and thorough analysis. Get to know your technician and salesperson. Schedule waterproofing procedures when you’re not busy. If budget permits, have them install stone flooring. Stone flooring solves concrete floor problems permanently. Install flood alarms in case unexpected heavy rains occur. During a hurricane, make sure to unplug your appliances. During a hurricane, observe your pump’s performance. Temperature starts to drop in the Fall. It’s a prelude to another season of possible ice but the average temperature remains warm. It clocks at 40 to 54 Degrees Fahrenheit (New York Logue, May 2013). That’s why; most of your home improvement activities need to focus on preparation. Seal tiny basement floor and wall cracks. Apply sealer in the walls (Or, let Vulcan do it). Repair water pipes that leak. Consult a professional if there’s still leaking. Install a French drain if budget permits. Remember: Vulcan Waterproofing is here to solve all your wet basement needs. Call us at (877) 885-2268 or complete the form at //vulcanwaterpoofing.com!